For other uses, see Rocket (disambiguation). In fact, rockets work more efficiently in space than in an atmosphere. Multistage rockets are capable of attaining escape velocity from Earth and therefore can achieve unlimited maximum altitude. Compared with airbreathing engines, rockets are lightweight and powerful and capable of generating large accelerations. To control their flight, rockets rely on momentum, airfoils, auxiliary reaction engines, gimballed thrust, momentum wheels, deflection of the exhaust stream, propellant flow, spin, or gravity. Rockets for military and recreational uses date back to at least 13th-century China. Significant scientific, interplanetary and industrial use did not occur until the 20th century, when rocketry was the enabling technology for the Space Age, including setting foot on the Earth's moon. Rockets are now used for fireworks, weaponry, ejection seats, launch vehicles for artificial satellites, human spaceflight, and space exploration. Chemical rockets are the most common type of high power rocket, typically creating a high speed exhaust by the combustion of fuel with an oxidizer. The stored propellant can be a simple pressurized gas or a single liquid fuel that disassociates in the presence of a catalyst (monopropellants), two liquids that spontaneously react on contact (hypergolic propellants), two liquids that must be ignited to react, a solid combination of fuel with oxidizer (solid fuel), or solid fuel with liquid oxidizer (hybrid propellant system). Chemical rockets store a large amount of energy in an easily released form, and can be very dangerous. However, careful design, testing, construction and use minimizes risks. The first gunpowder-powered rockets evolved in medieval China under the Song dynasty by the 13th century. The Mongols adopted Chinese rocket technology and the invention spread via the Mongol invasions to the Middle East and to Europe in the mid-13th century. Rockets are recorded[by whom?] in use by the Song navy in a military exercise dated to 1245. Internal-combustion rocket propulsion is mentioned in a reference to 1264, recording that the "ground-rat", a type of firework, had frightened the Empress-Mother Gongsheng at a feast held in her honor by her son the Emperor Lizong. Subsequently, rockets are included in the military treatise Huolongjing, also known as the Fire Drake Manual, written by the Chinese artillery officer Jiao Yu in the mid-14th century. This text mentions the first known multistage rocket, the 'fire-dragon issuing from the water' (huo long chu shui), thought to have been used by the Chinese navy. Medieval and early modern rockets were used militarily as incendiary weapons in sieges. Between 1270 and 1280, Hasan al-Rammah wrote al-furusiyyah wa al-manasib al-harbiyya (The Book of Military Horsemanship and Ingenious War Devices), which included 107 gunpowder recipes, 22 of them for rockets. In Europe, Konrad Kyeser described rockets in his military treatise Bellifortis around 1405. The name "rocket" comes from the Italian rocchetta, meaning "bobbin" or "little spindle", given due to the similarity in shape to the bobbin or spool used to hold the thread to be fed to a spinning wheel. Leonhard Fronsperger and Conrad Haas adopted the Italian term into German in the mid-16th century; "rocket" appears in English by the early 17th century.Artis Magnae Artilleriae pars prima, an important early modern work on rocket artillery, by Kazimierz Siemienowicz, was first printed in Amsterdam in 1650. The Mysorean rockets were the first successful iron-cased rockets, developed in the late 18th century in the Kingdom of Mysore (part of present-day India) by Tipu Sultan. The Congreve rocket was a British weapon designed and developed by Sir William Congreve in 1804. This rocket was based directly on the Mysorean rockets, used compressed powder and was fielded in the Napoleonic Wars. It was Congreve rockets that Francis Scott Key was referring to when he wrote of the "rockets' red glare" while held captive on a British ship that was laying siege to Fort McHenry in 1814. Together, the Mysorean and British innovations increased the effective range of military rockets from 100 to 2,000 yards. The first mathematical treatment of the dynamics of rocket propulsion is due to William Moore (1813). In 1815 Alexander Dmitrievich Zasyadko constructed rocket-launching platforms, which allowed rockets to be fired in salvos (6 rockets at a time), and gun-laying devices. William Hale in 1844 greatly increased the accuracy of rocket artillery. Edward Mounier Boxer further improved the Congreve rocket in 1865. 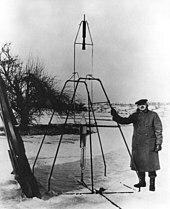 Modern rockets originated in 1926 when Goddard attached a supersonic (de Laval) nozzle to the combustion chamber of a liquid-propellant rocket. These nozzles turn the hot gas from the combustion chamber into a cooler, hypersonic, highly directed jet of gas, more than doubling the thrust and raising the engine efficiency from 2% to 64%. Use of liquid propellants instead of gunpowder greatly improved the effectiveness of rocket artillery in World War II, and opened up the possibility of manned spaceflight after 1945. In 1943 production of the V-2 rocket began in Germany. In parallel with the German guided-missile programme, rockets were also used on aircraft, either for assisting horizontal take-off (RATO), vertical take-off (Bachem Ba 349 "Natter") or for powering them (Me 163, see list of World War II guided missiles of Germany). The Allies' rocket programs were less technological, relying mostly on unguided missiles like the Soviet Katyusha rocket. The Americans captured a large number of German rocket scientists, including Wernher von Braun, in 1945, and brought them to the United States as part of Operation Paperclip. After World War II scientists used rockets to study high-altitude conditions, by radio telemetry of temperature and pressure of the atmosphere, detection of cosmic rays, and further techniques; note too the Bell X-1, the first manned vehicle to break the sound barrier (1947). Independently, in the Soviet Union's space program research continued under the leadership of the chief designer Sergei Korolev (1907–1966). During the Cold War rockets became extremely important militarily with the development of modern intercontinental ballistic missiles (ICBMs). The 1960s saw rapid development of rocket technology, particularly in the Soviet Union (Vostok, Soyuz, Proton) and in the United States (e.g. the X-15). Rockets came into use for space exploration. 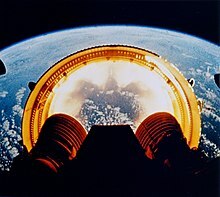 American manned programs (Project Mercury, Project Gemini and later the Apollo programme) culminated in 1969 with the first manned landing on the Moon – using equipment launched by the Saturn V rocket. A rocket design can be as simple as a cardboard tube filled with black powder, but to make an efficient, accurate rocket or missile involves overcoming a number of difficult problems. The main difficulties include cooling the combustion chamber, pumping the fuel (in the case of a liquid fuel), and controlling and correcting the direction of motion. Rockets consist of a propellant, a place to put propellant (such as a propellant tank), and a nozzle. They may also have one or more rocket engines, directional stabilization device(s) (such as fins, vernier engines or engine gimbals for thrust vectoring, gyroscopes) and a structure (typically monocoque) to hold these components together. Rockets intended for high speed atmospheric use also have an aerodynamic fairing such as a nose cone, which usually holds the payload. As well as these components, rockets can have any number of other components, such as wings (rocketplanes), parachutes, wheels (rocket cars), even, in a sense, a person (rocket belt). Vehicles frequently possess navigation systems and guidance systems that typically use satellite navigation and inertial navigation systems. Rocket engines employ the principle of jet propulsion. The rocket engines powering rockets come in a great variety of different types; a comprehensive list can be found in rocket engine. Most current rockets are chemically powered rockets (usually internal combustion engines, but some employ a decomposing monopropellant) that emit a hot exhaust gas. 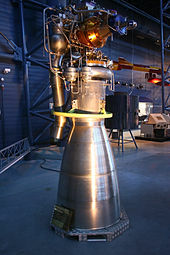 A rocket engine can use gas propellants, solid propellant, liquid propellant, or a hybrid mixture of both solid and liquid. Some rockets use heat or pressure that is supplied from a source other than the chemical reaction of propellant(s), such as steam rockets, solar thermal rockets, nuclear thermal rocket engines or simple pressurized rockets such as water rocket or cold gas thrusters. With combustive propellants a chemical reaction is initiated between the fuel and the oxidizer in the combustion chamber, and the resultant hot gases accelerate out of a rocket engine nozzle (or nozzles) at the rearward-facing end of the rocket. The acceleration of these gases through the engine exerts force ("thrust") on the combustion chamber and nozzle, propelling the vehicle (according to Newton's Third Law). This actually happens because the force (pressure times area) on the combustion chamber wall is unbalanced by the nozzle opening; this is not the case in any other direction. The shape of the nozzle also generates force by directing the exhaust gas along the axis of the rocket. Rocket propellant is mass that is stored, usually in some form of propellant tank or casing, prior to being used as the propulsive mass that is ejected from a rocket engine in the form of a fluid jet to produce thrust. For chemical rockets often the propellants are a fuel such as liquid hydrogen or kerosene burned with an oxidizer such as liquid oxygen or nitric acid to produce large volumes of very hot gas. The oxidiser is either kept separate and mixed in the combustion chamber, or comes premixed, as with solid rockets. For smaller, low performance rockets such as attitude control thrusters where high performance is less necessary, a pressurised fluid is used as propellant that simply escapes the spacecraft through a propelling nozzle. 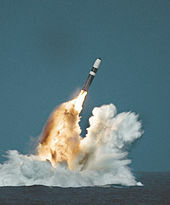 Some military weapons use rockets to propel warheads to their targets. A rocket and its payload together are generally referred to as a missile when the weapon has a guidance system (not all missiles use rocket engines, some use other engines such as jets) or as a rocket if it is unguided. Anti-tank and anti-aircraft missiles use rocket engines to engage targets at high speed at a range of several miles, while intercontinental ballistic missiles can be used to deliver multiple nuclear warheads from thousands of miles, and anti-ballistic missiles try to stop them. Rockets have also been tested for reconnaissance, such as the Ping-Pong rocket, which was launched to surveil enemy targets, however, recon rockets have never come into wide use in the military. Sounding rockets are commonly used to carry instruments that take readings from 50 kilometers (31 mi) to 1,500 kilometers (930 mi) above the surface of the Earth. Larger rockets are normally launched from a launch pad that provides stable support until a few seconds after ignition. Due to their high exhaust velocity—2,500 to 4,500 m/s (9,000 to 16,200 km/h; 5,600 to 10,100 mph)—rockets are particularly useful when very high speeds are required, such as orbital speed at approximately 7,800 m/s (28,000 km/h; 17,000 mph). Spacecraft delivered into orbital trajectories become artificial satellites, which are used for many commercial purposes. Indeed, rockets remain the only way to launch spacecraft into orbit and beyond. They are also used to rapidly accelerate spacecraft when they change orbits or de-orbit for landing. Also, a rocket may be used to soften a hard parachute landing immediately before touchdown (see retrorocket). This was the case when the Safety Assurance System (Soviet nomenclature) successfully pulled away the L3 capsule during three of the four failed launches of the Soviet moon rocket, N1 vehicles 3L, 5L and 7L. In all three cases the capsule, albeit unmanned, was saved from destruction. Only the three aforementioned N1 rockets had functional Safety Assurance Systems. The outstanding vehicle, 6L, had dummy upper stages and therefore no escape system giving the N1 booster a 100% success rate for egress from a failed launch. A successful escape of a manned capsule occurred when Soyuz T-10, on a mission to the Salyut 7 space station, exploded on the pad. Hobbyists build and fly a wide variety of model rockets. Many companies produce model rocket kits and parts but due to their inherent simplicity some hobbyists have been known to make rockets out of almost anything. Rockets are also used in some types of consumer and professional fireworks. A Water Powered Rocket is a type of model rocket using water as its reaction mass. The pressure vessel (the engine of the rocket) is usually a used plastic soft drink bottle. The water is forced out by a pressurized gas, typically compressed air. It is an example of Newton's third law of motion. The scale of amateur rocketry can range from a small rocket launched in one's own backyard to a rocket that reached space. Amateur rocketry is split into three categories: low power, mid power, and high power. Australia, Austria, Canada, Germany, New Zealand, Switzerland, the United Kingdom, and the United States have high power rocket associations which provide certifications to its members to fly different rocket motor sizes. While joining these organizations is not a requirement, they often provide insurance and flight waivers for their members. Corpulent Stump is the most powerful non commercial rocket ever launched on an Aerotech engine in the United Kingdom. Rocket exhaust generates a significant amount of acoustic energy. As the supersonic exhaust collides with the ambient air, shock waves are formed. The sound intensity from these shock waves depends on the size of the rocket as well as the exhaust velocity. The sound intensity of large, high performance rockets could potentially kill at close range. The Space Shuttle generated 180 dB of noise around its base. To combat this, NASA developed a sound suppression system which can flow water at rates up to 900,000 gallons per minute (57 m3/s) onto the launch pad. The water reduces the noise level from 180 dB down to 142 dB (the design requirement is 145 dB). Without the sound suppression system, acoustic waves would reflect off of the launch pad towards the rocket, vibrating the sensitive payload and crew. These acoustic waves can be so severe as to damage or destroy the rocket. Noise is generally most intense when a rocket is close to the ground, since the noise from the engines radiates up away from the jet, as well as reflecting off the ground. This noise can be reduced somewhat by flame trenches with roofs, by water injection around the jet and by deflecting the jet at an angle. In a closed chamber, the pressures are equal in each direction and no acceleration occurs. If an opening is provided in the bottom of the chamber then the pressure is no longer acting on the missing section. This opening permits the exhaust to escape. The remaining pressures give a resultant thrust on the side opposite the opening, and these pressures are what push the rocket along. The shape of the nozzle is important. Consider a balloon propelled by air coming out of a tapering nozzle. In such a case the combination of air pressure and viscous friction is such that the nozzle does not push the balloon but is pulled by it. 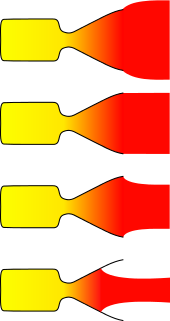 Using a convergent/divergent nozzle gives more force since the exhaust also presses on it as it expands outwards, roughly doubling the total force. If propellant gas is continuously added to the chamber then these pressures can be maintained for as long as propellant remains. Note that in the case of liquid propellant engines, the pumps moving the propellant into the combustion chamber must maintain a pressure larger than the combustion chamber – typically on the order of 100 atmospheres. As a side effect, these pressures on the rocket also act on the exhaust in the opposite direction and accelerate this exhaust to very high speeds (according to Newton's Third Law). From the principle of conservation of momentum the speed of the exhaust of a rocket determines how much momentum increase is created for a given amount of propellant. This is called the rocket's specific impulse. Because a rocket, propellant and exhaust in flight, without any external perturbations, may be considered as a closed system, the total momentum is always constant. Therefore, the faster the net speed of the exhaust in one direction, the greater the speed of the rocket can achieve in the opposite direction. This is especially true since the rocket body's mass is typically far lower than the final total exhaust mass. The general study of the forces on a rocket is part of the field of ballistics. Spacecraft are further studied in the subfield of astrodynamics. 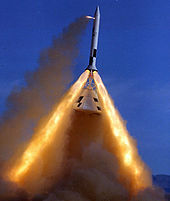 These forces, with a stabilizing tail (the empennage) present will, unless deliberate control efforts are made, naturally cause the vehicle to follow a roughly parabolic trajectory termed a gravity turn, and this trajectory is often used at least during the initial part of a launch. (This is true even if the rocket engine is mounted at the nose.) Vehicles can thus maintain low or even zero angle of attack, which minimizes transverse stress on the launch vehicle, permitting a weaker, and hence lighter, launch vehicle. Drag is a force opposite to the direction of the rocket's motion relative to any air it is moving through. This slows the speed of the vehicle and produces structural loads. The deceleration forces for fast-moving rockets are calculated using the drag equation. Drag can be minimised by an aerodynamic nose cone and by using a shape with a high ballistic coefficient (the "classic" rocket shape—long and thin), and by keeping the rocket's angle of attack as low as possible. For a more detailed model of the net thrust of a rocket engine that includes the effect of atmospheric pressure, see Rocket_engine § Net_thrust. is more or less the speed the exhaust leaves the vehicle, and in the vacuum of space, the effective exhaust velocity is often equal to the actual average exhaust speed along the thrust axis. However, the effective exhaust velocity allows for various losses, and notably, is reduced when operated within an atmosphere. The rate of propellant flow through a rocket engine is often deliberately varied over a flight, to provide a way to control the thrust and thus the airspeed of the vehicle. This, for example, allows minimization of aerodynamic losses and can limit the increase of g-forces due to the reduction in propellant load. The total impulse of a multi-stage rocket is the sum of the impulses of the individual stages. As can be seen from the thrust equation, the effective speed of the exhaust controls the amount of thrust produced from a particular quantity of fuel burnt per second. is determined by measurement while testing the engine. In practice the effective exhaust velocities of rockets varies but can be extremely high, ~4500 m/s, about 15 times the sea level speed of sound in air. When launched from the Earth practical delta-vs for a single rockets carrying payloads can be a few km/s. Some theoretical designs have rockets with delta-vs over 9 km/s. is sometimes called the mass ratio. Almost all of a launch vehicle's mass consists of propellant. Mass ratio is, for any 'burn', the ratio between the rocket's initial mass and its final mass. Everything else being equal, a high mass ratio is desirable for good performance, since it indicates that the rocket is lightweight and hence performs better, for essentially the same reasons that low weight is desirable in sports cars. 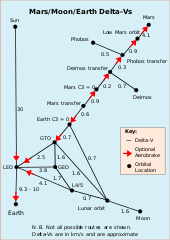 Thus far, the required velocity (delta-v) to achieve orbit has been unattained by any single rocket because the propellant, tankage, structure, guidance, valves and engines and so on, take a particular minimum percentage of take-off mass that is too great for the propellant it carries to achieve that delta-v carrying reasonable payloads. Since Single-stage-to-orbit has so far not been achievable, orbital rockets always have more than one stage. 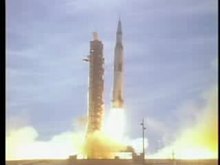 For example, the first stage of the Saturn V, carrying the weight of the upper stages, was able to achieve a mass ratio of about 10, and achieved a specific impulse of 263 seconds. This gives a delta-v of around 5.9 km/s whereas around 9.4 km/s delta-v is needed to achieve orbit with all losses allowed for. This problem is frequently solved by staging—the rocket sheds excess weight (usually empty tankage and associated engines) during launch. Staging is either serial where the rockets light after the previous stage has fallen away, or parallel, where rockets are burning together and then detach when they burn out. As the remaining propellant decreases, rocket vehicles become lighter and their acceleration tends to increase until the propellant is exhausted. This means that much of the speed change occurs towards the end of the burn when the vehicle is much lighter. However, the thrust can be throttled to offset or vary this if needed. Discontinuities in acceleration also occur when stages burn out, often starting at a lower acceleration with each new stage firing. Peak accelerations can be increased by designing the vehicle with a reduced mass, usually achieved by a reduction in the fuel load and tankage and associated structures, but obviously this reduces range, delta-v and burn time. Still, for some applications that rockets are used for, a high peak acceleration applied for just a short time is highly desirable. The minimal mass of vehicle consists of a rocket engine with minimal fuel and structure to carry it. In that case the thrust-to-weight ratio[nb 3] of the rocket engine limits the maximum acceleration that can be designed. It turns out that rocket engines generally have truly excellent thrust to weight ratios (137 for the NK-33 engine, some solid rockets are over 1000:442), and nearly all really high-g vehicles employ or have employed rockets. The high accelerations that rockets naturally possess means that rocket vehicles are often capable of vertical takeoff, and in some cases, with suitable guidance and control of the engines, also vertical landing. For these operations to be done it is necessary for a vehicle's engines to provide more than the local gravitational acceleration.
) would mean that all the heat energy of the combustion products is converted into kinetic energy of the jet. This is not possible, but the near-adiabatic high expansion ratio nozzles that can be used with rockets come surprisingly close: when the nozzle expands the gas, the gas is cooled and accelerated, and an energy efficiency of up to 70% can be achieved. Most of the rest is heat energy in the exhaust that is not recovered. :37–38 The high efficiency is a consequence of the fact that rocket combustion can be performed at very high temperatures and the gas is finally released at much lower temperatures, and so giving good Carnot efficiency. However, as speeds rise, the resultant exhaust speed goes down, and the overall vehicle energetic efficiency rises, reaching a peak of around 100% of the engine efficiency when the vehicle is travelling exactly at the same speed that the exhaust is emitted. In this case the exhaust would ideally stop dead in space behind the moving vehicle, taking away zero energy, and from conservation of energy, all the energy would end up in the vehicle. The efficiency then drops off again at even higher speeds as the exhaust ends up traveling forwards – trailing behind the vehicle. of 0.7, a rocket flying at Mach 0.85 (which most aircraft cruise at) with an exhaust velocity of Mach 10, would have a predicted overall energy efficiency of 5.9%, whereas a conventional, modern, air-breathing jet engine achieves closer to 35% efficiency. Thus a rocket would need about 6x more energy; and allowing for the specific energy of rocket propellant being around one third that of conventional air fuel, roughly 18x more mass of propellant would need to be carried for the same journey. This is why rockets are rarely if ever used for general aviation. Since the energy ultimately comes from fuel, these considerations mean that rockets are mainly useful when a very high speed is required, such as ICBMs or orbital launch. For example, NASA's space shuttle fires its engines for around 8.5 minutes, consuming 1,000 tonnes of solid propellant (containing 16% aluminium) and an additional 2,000,000 litres of liquid propellant (106,261 kg of liquid hydrogen fuel) to lift the 100,000 kg vehicle (including the 25,000 kg payload) to an altitude of 111 km and an orbital velocity of 30,000 km/h. At this altitude and velocity, the vehicle has a kinetic energy of about 3 TJ and a potential energy of roughly 200 GJ. Given the initial energy of 20 TJ,[nb 4] the Space Shuttle is about 16% energy efficient at launching the orbiter. )—dominate for subsonic and supersonic atmospheric use, while rockets work best at hypersonic speeds. On the other hand, rockets serve in many short-range relatively low speed military applications where their low-speed inefficiency is outweighed by their extremely high thrust and hence high accelerations. One subtle feature of rockets relates to energy. A rocket stage, while carrying a given load, is capable of giving a particular delta-v. This delta-v means that the speed increases (or decreases) by a particular amount, independent of the initial speed. However, because kinetic energy is a square law on speed, this means that the faster the rocket is travelling before the burn the more orbital energy it gains or loses. This fact is used in interplanetary travel. It means that the amount of delta-v to reach other planets, over and above that to reach escape velocity can be much less if the delta-v is applied when the rocket is travelling at high speeds, close to the Earth or other planetary surface; whereas waiting until the rocket has slowed at altitude multiplies up the effort required to achieve the desired trajectory. The reliability of rockets, as for all physical systems, is dependent on the quality of engineering design and construction. Because of the enormous chemical energy in rocket propellants (greater energy by weight than explosives, but lower than gasoline), consequences of accidents can be severe. Most space missions have some problems. 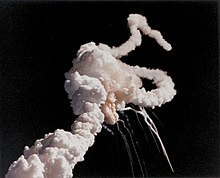 In 1986, following the Space Shuttle Challenger disaster, American physicist Richard Feynman, having served on the Rogers Commission estimated that the chance of an unsafe condition for a launch of the Shuttle was very roughly 1%; more recently the historical per person-flight risk in orbital spaceflight has been calculated to be around 2% or 4%. The costs of rockets can be roughly divided into propellant costs, the costs of obtaining and/or producing the 'dry mass' of the rocket, and the costs of any required support equipment and facilities. Most of the takeoff mass of a rocket is normally propellant. However propellant is seldom more than a few times more expensive than gasoline per kilogram (as of 2009 gasoline was about $1/kg [$0.45/lb] or less), and although substantial amounts are needed, for all but the very cheapest rockets, it turns out that the propellant costs are usually comparatively small, although not completely negligible. With liquid oxygen costing $0.15 per kilogram ($0.068/lb) and liquid hydrogen $2.20/kg ($1.00/lb), the Space Shuttle in 2009 had a liquid propellant expense of approximately $1.4 million for each launch that cost $450 million from other expenses (with 40% of the mass of propellants used by it being liquids in the external fuel tank, 60% solids in the SRBs). Even though a rocket's non-propellant, dry mass is often only between 5–20% of total mass, nevertheless this cost dominates. For hardware with the performance used in orbital launch vehicles, expenses of $2000–$10,000+ per kilogram of dry weight are common, primarily from engineering, fabrication, and testing; raw materials amount to typically around 2% of total expense. For most rockets except reusable ones (shuttle engines) the engines need not function more than a few minutes, which simplifies design. Extreme performance requirements for rockets reaching orbit correlate with high cost, including intensive quality control to ensure reliability despite the limited safety factors allowable for weight reasons. Components produced in small numbers if not individually machined can prevent amortization of R&D and facility costs over mass production to the degree seen in more pedestrian manufacturing. Amongst liquid-fueled rockets, complexity can be influenced by how much hardware must be lightweight, like pressure-fed engines can have two orders of magnitude lesser part count than pump-fed engines but lead to more weight by needing greater tank pressure, most often used in just small maneuvering thrusters as a consequence. To change the preceding factors for orbital launch vehicles, proposed methods have included mass-producing simple rockets in large quantities or on large scale, or developing reusable rockets meant to fly very frequently to amortize their up-front expense over many payloads, or reducing rocket performance requirements by constructing a non-rocket spacelaunch system for part of the velocity to orbit (or all of it but with most methods involving some rocket use). Rockets in applications other than launch to orbit (such as military rockets and rocket-assisted take off), commonly not needing comparable performance and sometimes mass-produced, are often relatively inexpensive. Since the early 2010s, new private options for obtaining spaceflight services emerged, bringing substantial price pressure into the existing market. ^ English rocket, first attested in 1566 (OED), adopted from the Italian term, given due to the similarity in shape to the bobbin or spool used to hold the thread to be fed to a spinning wheel. The modern Italian term is razzo. ^ The energy density is 31MJ per kg for aluminum and 143 MJ/kg for liquid hydrogen, this means that the vehicle consumes around 5 TJ of solid propellant and 15 TJ of hydrogen fuel. ^ a b Bernhard, Jim (1 January 2007). Porcupine, Picayune, & Post: How Newspapers Get Their Names. University of Missouri Press. p. 126. ISBN 978-0-8262-6601-9. Archived from the original on 19 November 2017. Retrieved 28 May 2016. ^ a b c d e f g h i j k l m n o p q r s t Sutton, George P.; Biblarz, Oscar (2001). Rocket Propulsion Elements. John Wiley & Sons. ISBN 978-0-471-32642-7. Archived from the original on 12 January 2014. Retrieved 28 May 2016. ^ MSFC History Office. "Rockets in Ancient Times (100 B.C. to 17th Century)". A Timeline of Rocket History. NASA. Archived from the original on 2009-07-09. Retrieved 2009-06-28. ^ "Rockets appear in Arab literature in 1258 A.D., describing Mongol invaders' use of them on February 15 to capture the city of Baghdad." "A brief history of rocketry". NASA Spacelink. Archived from the original on 2006-08-05. Retrieved 2006-08-19. ^ Crosby, Alfred W. (2002). Throwing Fire: Projectile Technology Through History. Cambridge: Cambridge University Press. pp. 100–103. ISBN 978-0-521-79158-8. ^ Needham, Volume 5, Part 7, 510. ^ Hassan, Ahmad Y. "Gunpowder Composition for Rockets and Cannon in Arabic Military Treatises In Thirteenth and Fourteenth Centuries". History of Science and Technology in Islam. Archived from the original on February 26, 2008. Retrieved March 29, 2008. ^ Hassan, Ahmad Y. "Transfer Of Islamic Technology To The West, Part III: Technology Transfer in the Chemical Industries". History of Science and Technology in Islam. Archived from the original on March 9, 2008. Retrieved 2008-03-29. ^ Riper, A. Bowdoin Van (2004). Rockets and missiles : the life story of a technology. Westport: Greenwood Press. p. 10. ISBN 978-0-313-32795-7. ^ "rocket and missile system | weapons system". Encyclopedia Britannica. Archived from the original on 2017-10-31. Retrieved 2017-10-29. ^ Leitch, William (1862). God's Glory in the Heavens. ^ "NASA History: Rocket vehicles". Hq.nasa.gov. Archived from the original on 2013-01-25. Retrieved 2012-12-10. ^ "OPEL Rocket vehicles". Strangevehicles.greyfalcon.us. Archived from the original on 2012-08-17. Retrieved 2012-12-10. ^ Kelion, Leo (2013-11-11). "Rocket bicycle sets 207mph speed record By Leo Kelion". BBC News. Archived from the original on 2014-11-11. Retrieved 2014-11-11. ^ Polmar, Norman; Moore, Kenneth J. (2004). Cold War submarines : the design and construction of U.S. and Soviet submarines. Washington, DC: Brassey's. p. 304. ISBN 978-1-57488-594-1. ^ III, compiled by A.D. Baker (2000). The Naval Institute guide to combat fleets of the world 2000–2001 : their ships, aircraft, and systems. Annapolis, MD: Naval Institute Press. p. 581. ISBN 978-1-55750-197-4. ^ "The Rocketman". The Rocketman. Archived from the original on 2010-02-13. Retrieved 2012-12-10. ^ Charles Lafayette Proctor II. "internal combustion engines". Concise Britannica. Archived from the original on 2008-01-14. Retrieved 2012-12-10. ^ Marconi:KSC, Elaine. "NASA – What is a Sounding Rocket?". www.nasa.gov. Archived from the original on 2 June 2016. Retrieved 28 May 2016. ^ "Test sets world land speed record". www.af.mil. Archived from the original on June 1, 2013. Retrieved 2008-03-18. ^ "Spaceflight Now-worldwide launch schedule". Spaceflightnow.com. Archived from the original on 2013-09-11. Retrieved 2012-12-10. ^ "Apollo launch escape subsystem". ApolloSaturn. Archived from the original on 2012-07-16. Retrieved 2012-12-10. ^ a b "Soyuz T-10-1 "Launch vehicle blew up on pad at Tyuratam; crew saved by abort system"". Astronautix.com. Archived from the original on 2014-08-05. Retrieved 2012-12-10. ^ Wade, Mark. "N1 Manned Lunar Launch Vehicle". astronautix.com. Encyclopedia Astronautica. Archived from the original on 4 February 2012. Retrieved 24 June 2014. ^ Wade, Mark. "N1 5L launch – 1969.07.03". astronautix.com. Encyclopedia Astronautica. Archived from the original on 27 July 2015. Retrieved 24 June 2014. ^ Harvey, Brian (2007). Soviet and Russian lunar exploration. Berlin: Springer. p. 226. ISBN 978-0-387-73976-2. ^ "N1 (vehicle 5L) moon rocket Test – launch abort system activated". YouTube.com. 2015 YouTube, LLC. Archived from the original on 17 May 2015. Retrieved 12 January 2015. ^ Wade, Mark. "Soyuz T-10-1". astronautix.com. Encyclopedia Astronautica. Archived from the original on 5 August 2014. Retrieved 24 June 2014. ^ Bonsor, Kevin (2001-06-27). "Howstuff works ejection seats". Science.howstuffworks.com. Archived from the original on 2010-04-06. Retrieved 2012-12-10. ^ "CSXT GO FAST! Rocket Confirms Multiple World Records". Colorado Space News. 4 September 2014. Archived from the original on 4 March 2016. ^ "Sammy Miller". Eurodragster.com. Archived from the original on 2013-06-02. Retrieved 2012-12-10. ^ "Launch Pad Vibroacoustics Research at NASA/KSC" Archived 2017-03-02 at the Wayback Machine, Retrieved on 30 April 2016. ^ "Sound Suppression System" Archived 2011-06-29 at the Wayback Machine, Retrieved on 30 April 2016. ^ Warren, J. W. (1979). Understanding force : an account of some aspects of teaching the idea of force in school, college and university courses in engineering, mathematics and science. London: Murray. pp. 37–38. ISBN 978-0-7195-3564-2. ^ Warren, J. W. (1979). Understanding force : an account of some aspects of teaching the idea of force in school, college and university courses in engineering, mathematics and science. London: Murray. p. 28. ISBN 978-0-7195-3564-2. ^ "NASA – Four forces on a model rocket". Grc.nasa.gov. 2000-09-19. Archived from the original on 2012-11-29. Retrieved 2012-12-10. ^ Glasstone, Samuel (1 January 1965). Sourcebook on the Space Sciences. D. Van Nostrand Co. p. 209. OCLC 232378. Archived from the original on 19 November 2017. Retrieved 28 May 2016. ^ Callaway, David W. (March 2004). "Coplanar Air Launch with Gravity-Turn Launch Trajectories" (PDF). Masters Thesis: 2. Archived from the original (PDF) on November 28, 2007. ^ a b "Space Shuttle Max-Q". Aerospaceweb. 2001-05-06. Retrieved 2012-12-10. ^ "General Electric J85". Geae.com. 2012-09-07. Archived from the original on 2011-07-22. Retrieved 2012-12-10. ^ "Mach 1 Club". Thrust SSC. Archived from the original on 2016-06-17. Retrieved 2016-05-28. ^ a b c d Braeunig, Robert A. (2008). "Rocket Propellants". Rocket & Space Technology. ^ "cislunar delta-vs". Strout.net. Archived from the original on 2000-03-12. Retrieved 2012-12-10. ^ "Choose Your Engine". Projectrho.com. 2012-06-01. Archived from the original on 2010-05-29. Retrieved 2012-12-10. ^ "The Evolution of Rockets". Istp.gsfc.nasa.gov. Archived from the original on 2013-01-08. Retrieved 2012-12-10. ^ "Rocket Mass Ratios". Exploration.grc.nasa.gov. Archived from the original on 2013-02-16. Retrieved 2012-12-10. ^ NASA (2006). "Rocket staging". Beginner's Guide to Rockets. NASA. Archived from the original on 2016-06-02. Retrieved 2016-05-28. ^ "Astronautix NK-33 entry". Astronautix.com. 2006-11-08. Archived from the original on 2002-06-25. Retrieved 2012-12-10. ^ "A brief history of space accidents". Jane's Civil Aerospace. 2003-02-03. Archived from the original on 2003-02-04. Retrieved 2010-04-24. ^ "Rogers commission Appendix F". Archived from the original on 2012-09-11. Retrieved 2012-12-10. ^ "Going Private: The Promise and Danger of Space Travel By Tariq Malik". Space.com. 2004-09-30. Archived from the original on 2011-01-07. Retrieved 2012-12-10. ^ "Weighing the risks of human spaceflight". The Space Review. 21 July 2003. Archived from the original on 23 November 2010. Retrieved 1 December 2010. ^ a b c d "A Rocket a Day Keeps the High Costs Away" Archived 2008-11-03 at the Wayback Machine by John Walker. September 27, 1993. ^ "Space Shuttle Use of Propellants and Fluids" (PDF). Nasa.gov. Archived from the original (PDF) on October 17, 2011. Retrieved 2011-04-30. ^ "NASA Launch Vehicles and Facilities". Nasa.gov. Archived from the original on 2011-04-27. Retrieved 2011-04-30. ^ "NASA – Space Shuttle and International Space Station". Nasa.gov. Archived from the original on 2011-05-07. Retrieved 2011-04-30. ^ "Mass Fraction". Andrews Space and Technology (original figure source). Archived from the original on 2012-04-25. Retrieved 2011-04-30. ^ a b c d U.S. Air Force Research Report No. AU-ARI-93-8: LEO On The Cheap. Retrieved April 29, 2011. ^ "Europe to press ahead with Ariane 6 rocket". BBC News. Retrieved 2015-06-25. ^ Belfiore, Michael (2013-12-09). "The Rocketeer". Foreign Policy. Retrieved 2013-12-11. ^ Pasztor, Andy (2015-09-17). "U.S. Rocket Supplier Looks to Break 'Short Leash'". Wall Street Journal. Retrieved 2015-10-14. " The aerospace giants [Boeing Co. and Lockheed Martin Corp.] shared almost $500 million in equity profits from the rocket-making venture last year, when it still had a monopoly on the business of blasting the Pentagon's most important satellites into orbit. But since then, 'they've had us on a very short leash,' Tory Bruno, United Launch's chief executive", said.